I hope everyone at Desert Trip weekend two brought their umbrellas to the polo fields, for it sounded like the Rihanna reign just wouldn't let up. During Sir Paul McCartney’s set at the music festival on Saturday evening, the music legend was like, "Hey, Oldchella? Get ready to lose every last one of your marbles over this surprise guest" (I'm paraphrasing) and then welcomed the one and only Robyn Fenty to the stage. 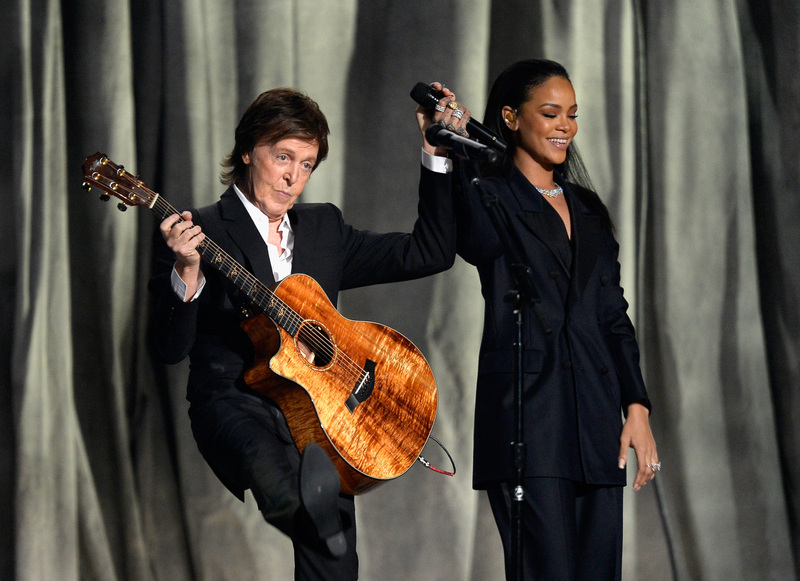 And for the first time since the 2015 Grammys, Rihanna and Paul McCartney performed “FourFiveSeconds” together. The Beatle belted out Kanye West’s parts, RiRi belted out her parts, and now I can't stop belting out abut how jealous I am of everyone who saw this in real life. As much as I love and adore and cherish Kanye West, it is neat to hear Paul McC sing the Ye part. Ack, “neat” feels like an offensive understatement. I mean, hi, it’s Sir Paul McCartney. It really doesn't get much better than Macca. Rih and McC sound so fire. I could listen to them sing together forever. If they did an album of duets, I’d be down. “FourFiveSeconds” still seems too good to be real. It's real, right? Right? Is there a way to confirm? I need one of those totem things from Inception. But instead of letting me know whether I'm asleep or awake, the totem would just confirm "FourFiveSeconds" isn't a beautiful figment of our collective imagination. If every radio station played “FourFiveSeconds” once an hour, I’d be into it. How is a Paul McC/RiRi/Yeezus track not the biggest track of all time? What a power trio. My favorite moment? Uh, it might be the part when Rih nails the bridge and then dances it out while Paul McC sings. Or it might be every time Paul McC lets out a Paul McC wail. Or it might be when Paul McC and Rih hug each other at the end. I can't decide. That oversized pinstripe pantsuit is my Patronus.